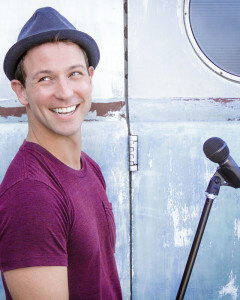 Mikey Scott is a fun-loving, well-rounded guy who enjoys traveling and children. He’s up for an adventurous night out as much as a quiet night at home with his man. Mikey Scott is one of the hottest up-n-coming comedians working today. His unique interpretation of life events combined with his need to over-share have made Mikey a hit amongst straight girls in their late 20’s who are looking to hook someone up with their gay roommate. On stage you can catch him every Friday night as the co-host of the Mikey & Teddy Comedy Hour in West Hollywood as well as a slew of venues you had no idea even existed. On screen you can see him in the movie Bro, What Happened? and in Dante Presents: The Gay List. He’s appeared on Showtime’s VNA Awards and Oxygen’s Funny Girls and was a writer for Joan Rivers on Fashion Police. On your phone you can read his unrequested dating advice in Instinct magazine and on Gay.Net and occasionally his ranting on other popular sites such as The Good Men Project. And finally, if you swing by a show and want to send a cocktail to the stage for Mikey, he drinks a Rose Kennedy.